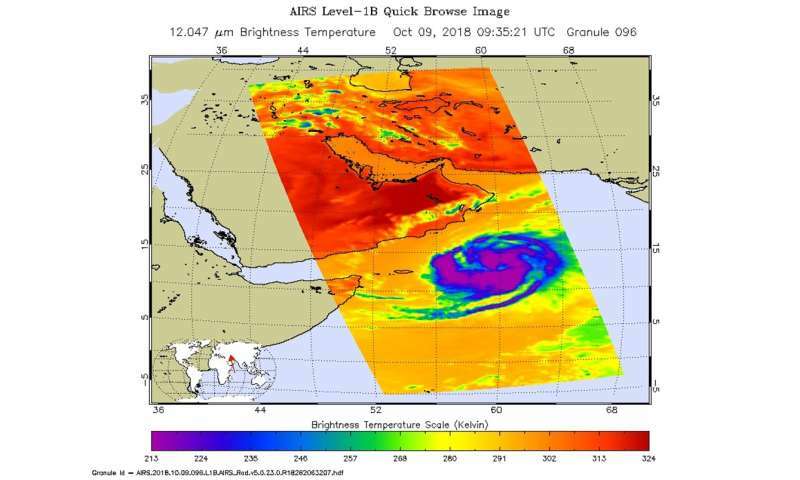 The Atmospheric Infrared Sounder or AIRS instrument aboard NASA's Aqua satellite passed over Luban on Oct. 9 at 5:35 a.m. EDT (0935 UTC). AIRS uses infrared light and infrared light provides scientists with temperature data and that's important when trying to understand how strong storms can be. The higher the cloud tops, the colder and the stronger they are. So infrared light as that gathered by the AIRS instrument can identify the strongest areas of a tropical cyclone. At the time Aqua passed overhead, coldest cloud top temperatures in thunderstorms appeared around the center and in thick bands of thunderstorms northeast and southwest of the center. Those temperatures were as cold as or colder than minus 63 degrees Fahrenheit (minus 53 degrees Celsius). The Joint Typhoon Warning Center noted that satellite data also shows a slowly consolidating system with weak, fragmented, but very expansive rain bands feeding into an obscured center. At 5 a.m. EDT (0900 UTC), the center of Luban was located near latitude 13.2 degrees north and longitude 60.1 degrees east. That's 416 nautical miles east-southeast of Salalah, Oman. Luban is moving toward the west-northwest. Maximum sustained winds were near 55 knots (63 mph/102 kph). Luban is forecast to intensify to 65 knots (74 mph) and make hurricane strength as it moves west-northwest and later west. The storm will weaken before approaching the coasts of Oman and Yemen on Friday, Oct. 12.